Abstract: What's inside the box is much more exciting than corrugated cardboard ever was - a 47" rear projection HDTV capable of 1080i/480p! Rear projection displays are little bit temperamental when it comes being moved around so to make the focusing task simple and quick, Samsung have built in a one touch "Perfect Focus" tool which will adjusts the display to factory presets. Keep in mind that the screen of a rear projection HDTV is never going to be as sharp as that of a standard CRT television. From about 10 feet back the screen should be nice and clear, and the colours aligned as much as possible. If you are really intent on surrounding yourself with the best and most accurate picture you can, you may want to have a technician come in and calibrate the display for your exact viewing environmental.This is not something you can do yourself because of the equipment it requires, but supposedly this makes a difference worth spending the few hundred it will cost. After letting the HCL473W go through the 30 second "perfect focus" process, we found it useful to also go into the setup menu and manually adjust the convergence at least once to get the best results. At the manual convergence screen there are nine test patterns spread from corner to corner. While adjusting the display the outside test patterns we all just about dead on, but not as perfect as the center test pattern. Like a standard computer monitor, the display will tend to be focused best at the very center of the screen, and a little less focused at the edges. The HCL473W did pretty well here according to what we could see - none of the small cross patterns were significantly out of convergence at the outer edges. When manually adjusting the convergence the remote lets you move the red or blue lens in any direction to get the best fit. We found it best to sit close to the display while adjusting the individual colours to yield a white test pattern. 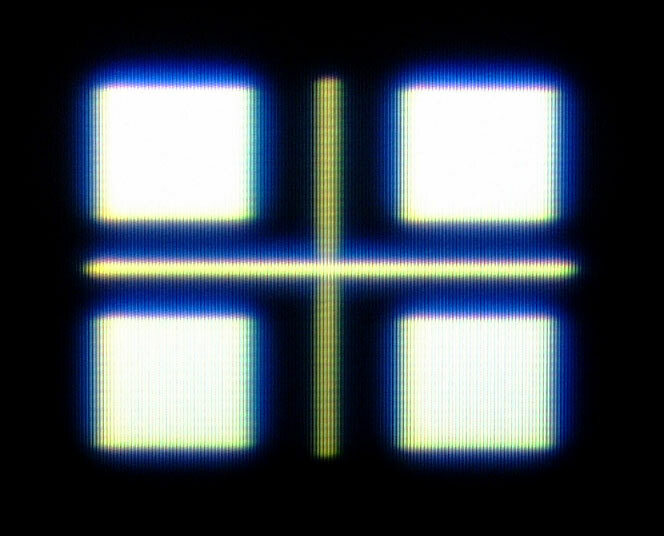 If you click on the correct convergence image you can see a high-res version which illustrates the display's sharpness. With a total of eight types of input the Samsung HCL473W should be able to tackle most devices. 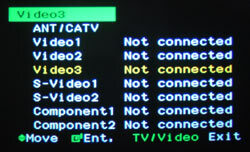 Switching between the different inputs is simplified because you can only chose what is actually connected (which will be displayed). Basic setting for bass, treble and balance are accessible from this menu along with the option to enable Dolby Pro Logic which has a few interesting presets (Phantom, Normal, Wide). If you need to test the speakers out you can also kick in a test tone, which will walk from the left speakers to the right. The HCL473W has a buit-in TV tuner but you will need to attach an antenna or plug in cable to see a picture obviously. Basic functions of the HCL473W include changing the language, locking out programs with the V-chip, setting the clock, and making adjustments to convergence (manually or via perfect focus). It is a good idea to adjust the display at least once manual after removing it from the box. Rear projection screens like this are really best viewed in a darkened room with the brightness of the unit set low. This will help keep the CRT's living a long life, and results in a nicer picture because the blacks don't appear "bright." The PIP feature splits the screen down the middle vertically giving you two large pictures that are about the same as a good sized CRT TV.